Is there meaningful information contained within a person’s breath? Could this information lead to early detection of cancer? The Pine Street Foundation is seeking to answer these questions with novel, ground-breaking research. Can dogs really detect cancer? How did you collect breath samples? Click here for answers to these questions and more. We provide dedicated educational and mentorship support to other researchers and trainers involved in training dogs to use their sense of smell in evaluating human health, which expands our reach beyond what has been achieved within our own group. 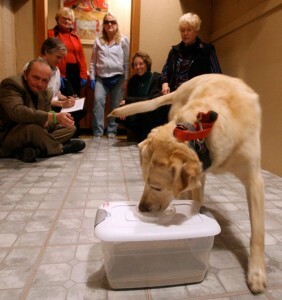 Lung Cancer Detection by Canine Scent: Will there be a lab in the lab? Work toward the development of an “electronic nose” for cancer detection has been underway for several decades; how- ever, dogs still appear to be ahead in the race and seem to have sniffed their way to the front of the line. Click here for more. Can dogs detect ovarian cancer? Click here for more on this current research project. This ground-breaking study was published in 2006. Click here for more information about this research as well as the full paper. From the New York Times to O Magazine, lots of people are talking about the Pine Street Foundation and our research. Click here for more.